Long summer evenings with skies painted pink and orange, the gentle breeze building as the sun begins to wane, and the aroma of charred beef over open flame filling the backyard – this is what summer grilling is all about! 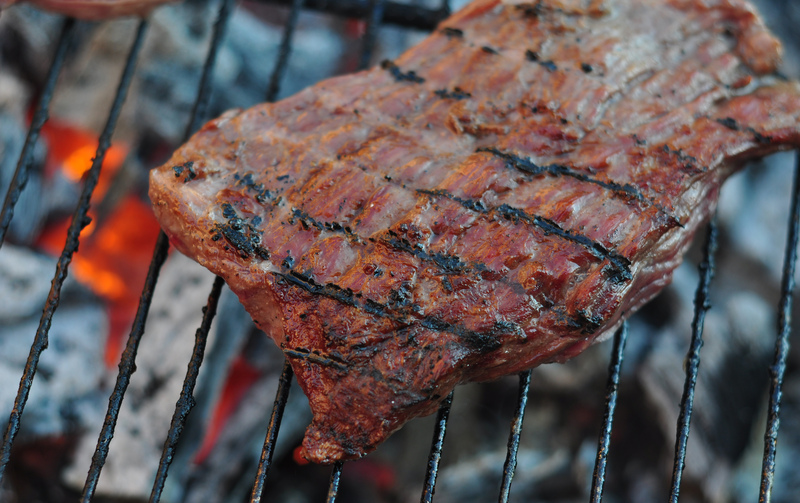 Get your summer grill on with Grilled Ginger-Marinated Flank Steak, a ginger-infused dish with both citrus and Asian influences. This is the perfect dish to enjoy these hot summer nights without spending extended time at the grill in the heat. While flank steak is not the most flavorful cut, its tougher tissue makes it perfect for marinating over extended times while the flavors permeate throughout. Using a marinade of sesame oil, ginger, garlic, honey, fresh lime juice, salt, and pepper, the steak is deeply infused with citrus, sweetness, and mild heat. Grilled over medium-high heat for approximately 6-8 minutes and allowed to rest for 10, the steak finishes tender and moist. Serve thinly sliced with lime wedges, or on tortillas with Mexican crème for fusion tacos. So fire up the grill, prepare the hammock, and enjoy the aerial and aromatic artistry of these wonderful summer nights. Purée oil, lime juice, honey, garlic, ginger, salt, and pepper in a food processor until smooth; pour into a bowl. Add steak and cover with plastic wrap. Let sit at room temperature for 30 minutes or chill overnight. Set a gas grill to medium-high. Remove flank from marinade; grill, turning as needed, until slightly charred and cooked to desired doneness, 6–8 minutes for medium rare or until an instant-read thermometer inserted into thickest part of the steak reads 125°. Let steak rest 10 minutes; thinly slice against the grain and serve with lime wedges.